The twelfth of May, 1944. The German countryside is blooming with the coming of spring. Germany’s struggle is coming to a crescendo as the Allies continue their assault on the Third Reich. Just above the deceptive peace of the countryside, Gruppenkommandeur Gunther Rall, assigned to JG/11 on the Western Front, is bounced by P-47’s of the 56th Fighter Group. Better known as Zemke’s Wolf pack, the 56th is the highest scoring USAAF fighter unit of the ETO, accounting for some 665-1/2 aircraft in the air. Rall is outnumbered four to one. Taking evasive action, Rall descends from the clouds toward the treetops, trying everything he knows to pull out and away from the much-too-powerful P-47’s. Weaving, twisting and at full throttle, even Rall is no match for the numbers against him. Finally, Rall’s 109 is within range and the P-47’s eight 50-caliber guns are making deadly strikes--igniting Rall’s aircraft and shooting his thumb off at the throttle. Rall has no choice but to pull into a half loop and bail out. To make matters worse, as Rall reaches the ground he is approached by a German farmer with a pitchfork who tries to impale him! After convincing the farmer he’s German, Rall stomps off to a local phone and is subsequently taken to a hospital where he would remain until 1944. 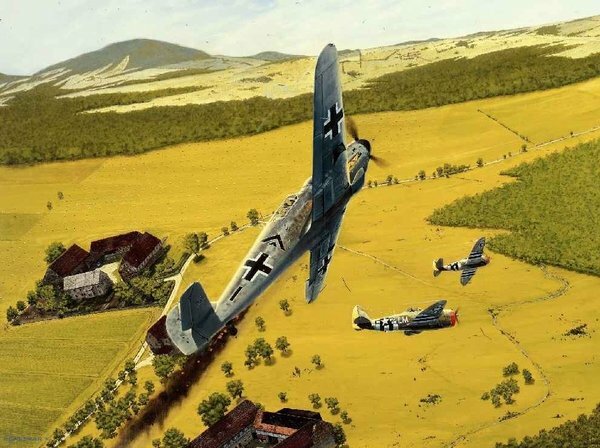 “Feeling the Wolves’ Bite” is artist Brian Bateman’s compelling depicting of Gunther Rall’s 109G during this encounter. With his palette Bateman captures the action and intense drama as Rall, on fire and wounded, begins to pull into a half loop as he prepares to bail out of his Messerschmitt for the first and only time in his career. A must for collectors of Rall memorabilia, “Feeling the Wolves’ Bite” is a drama on canvas, retelling this fascinating chapter of the war.